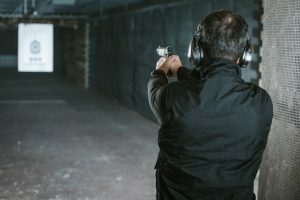 » Shoulder Holster vs IWB: What’s The Real Difference? When you’re planning on how you will begin to carry your handgun in a concealed way, it can be hard to know which method is better: shoulder holster vs IWB? Do you want to use a shoulder holster, as it is becoming popular once again, or is the inside-the-waistband (IWB) method still good for you? Largely, that decision depends on your particular needs and desires. Why are you carrying? In what situations will you be carrying? What kind of comfort do you prefer? 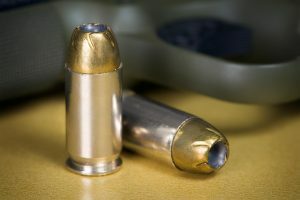 By answering these questions, you’ll be able to choose which of these carry methods is best for you. Let’s talk about shoulder holster vs IWB and help you figure out which is the right choice for your needs and lifestyle! A shoulder holster is a holster that holds a gun underneath your arm. This holster is held up with a strap, which goes around your chest and back. The placement when worn makes it very easy to keep everything hidden underneath your arm and under a shirt or jacket. 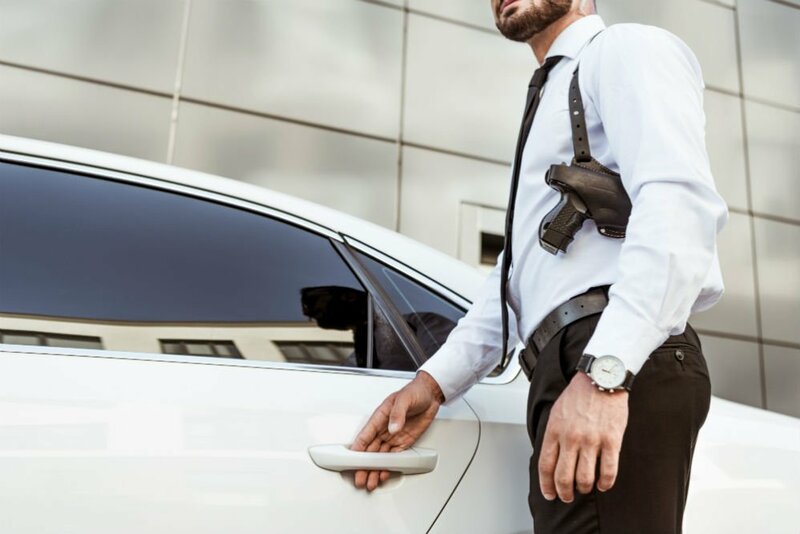 There are some situations where using a shoulder holster will make accessing your gun and ammunition much easier while still keeping things concealed. Shoulder holsters are often given a bad name because they are not always permitted in competition settings, but they can be used to carry a weapon securely and discreetly as well. Shoulder holsters used to be looked down on because of the position that they hold the gun in while being carried. These days, though, there are a number of variations available that you can choose from. Shoulder holsters are great for those who have to sit at a desk or in a car for many hours of their day. Because the holster and handgun will not get in the way of your waistband, it will not be uncomfortable. Plus, you will be able to present without needing to sit forward or stand up, which can make all the difference in an emergency situation. Shoulder holsters are most known for how comfortable they are. Another benefit of using a shoulder holster is that you can carry ammunition opposite of the handgun if you choose to. This can help you feel more secure, and it’s very easy to set up. Finally, shoulder holsters make it easy to conceal that you are carrying a weapon. All it takes is a loosely buttoned shirt or jacket to keep the outline of the gun out of view. This is great for those who feel more comfortable when no one can see that they have a weapon with them for various safety reasons. If you like wearing T-shirts or other tight-fitted clothing, this isn’t the concealment method for you. 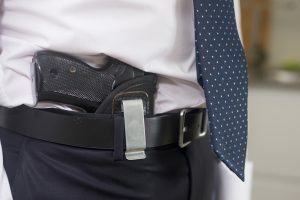 While it is always hard to conceal-carry in certain types of clothing, you need to wear some type of layers to cover up a shoulder holster successfully. Another problem is that in many shoulder holsters, the gun doesn’t point down but instead points behind your body. This can be dangerous for anyone around you, as you will be basically pointing it at them all day long. For this reason, you should only choose shoulder holsters that point downward. Finally, some people have issues with the shoulder holster because they are not good for protecting your weapon should you be in a serious situation. Grabbing the weapon from a shoulder holster exposes you to potentially having it stolen from you, and obviously, this can be a big issue. IWB stands for inside-the-waistband. When using this type of holster, the holster goes on the inside of the waistband and is attached to your belt. The most that will stick up over your waistband is the grip, and this is usually enough. When you use an IWB holster with your pistol, it will be nearly completely concealed, and that is one of the reasons why this method is so popular for some people. With an IWB holster, you can carry a defensive weapon discreetly, and that is often a key point when you want to begin to carry. Many people find that using an IWB holster is the best way to go when you want to have quick draw times and be able to protect your weapon adequately should you get into a scuffle with someone. 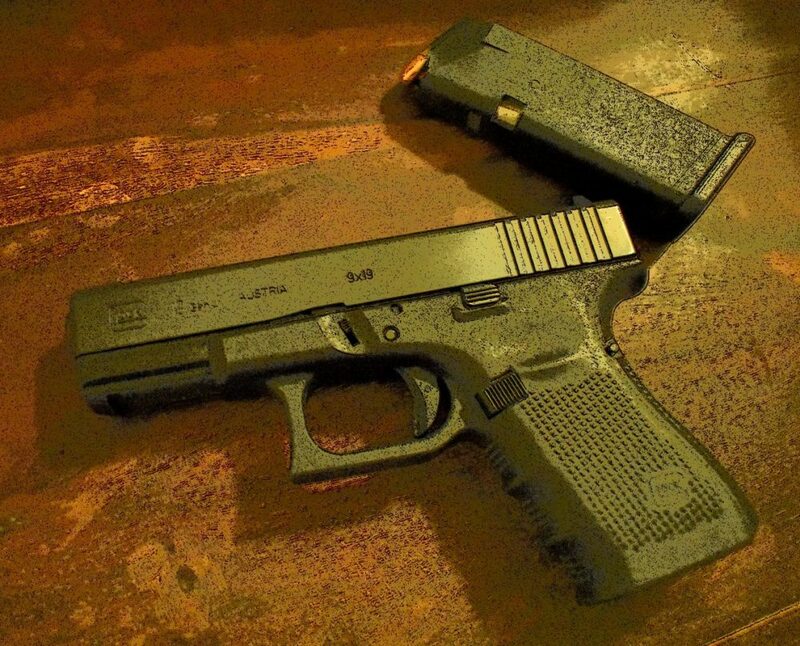 Because of the where the weapon is held, it is more protected than it would be in other types of holsters. It’s easier to use an IWB to conceal-carry during more seasons that with other holsters. Because it tucks into your waistband, the weapon can be carried even if you are wearing a t-shirt. Other types of holsters all but require you to wear a suit or jacket. One of the big drawbacks of using IWB holsters is that it can be difficult to figure out how to get them to fit comfortably at first. 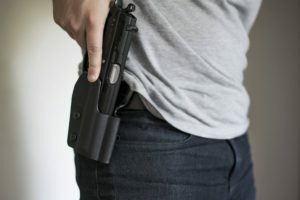 For some, the key lies in buying pants that are one or two sizes too big so that they can easily fit the pistol in place without feeling like their pants are too tight or strained. Another issue is specifically for those who are a bit larger or heavier. When you have more weight around your waist, keeping a weapon in an IWB holster can be inefficient and uncomfortable. Ultimately, it would depend on how your weight sits to decide if this would be an issue or not. 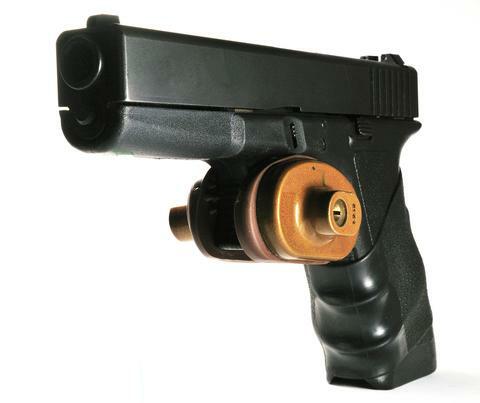 Another negative that comes with using this type of holster is when you need to do a fast draw. 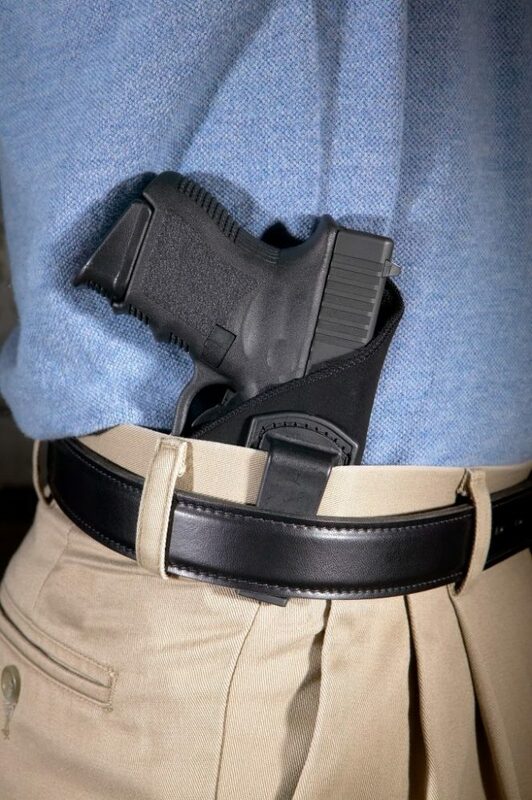 Some IWB holsters do not fully secure the hoster to your waistband or belt, and this can cause the clip or holster to come with the gun when you try to draw it quickly. 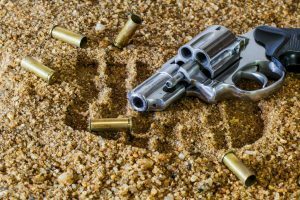 You can avoid this issue by investing in a high-quality IWB holster with stronger metal clips or a leather strap to keep it in place. Now that you know more about the shoulder vs IWB holster, it’s probably a bit easier to figure out which one is the right choice for you. If you’re still conflicted, we can help you to make your final decision. 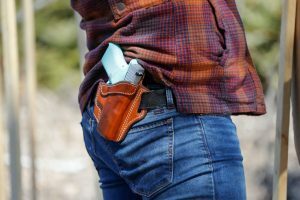 Overall, the IWB design tends to be better for most people when it comes to being able to wear whatever you want while carrying. That’s a big benefit, and that’s why we recommend the IWB holster more than its counterpart. After all, you also have to think less about what you are wearing to hide your weapon and more about what is going on around you when using an IWB holster.